Book or movie, optional. Glass of wine, essential. The stunning lobby makes a great place to hang out for a fierce game of Uno or Ticket to Ride. Double those recipes like the genius planner you are. You'll have a hungry crowd on your hands. Even the occasional winter day can be nice enough to sit outside, assuming you're still semi-bundled up from skiing. No standing around waiting for a shuttle. Ski-in/ski-out access is near the Snowflake Chair. Beautiful inside, spectacular outside – it's ideal for a weekend getaway or destination wedding in the mountains. Go for a swim in the heated outdoor pool, or just sit poolside and admire the mountain vistas. Relax and unwind at The Spa at Breckenridge. Enjoy a facial, massage, manicure, pedicure or aromatherapy. Relax in one of the three hot tubs and enjoy the beautiful views. Spruce Creek Trail is an easy (and scenic) 14-minute drive away. Grab your clubs and go. Breckenridge Golf Club is just 12 minutes drive from the resort. A comfortably luxe ski-in/ski-out resort between Peak 8 and 9 in the enviable Tyra Snowflake neighborhood, Blue Sky has an upscale boutique feel while going all-out on amenities. The gorgeous lobby greets you with soaring ceilings, a massive glowing fireplace and breathtaking mountain views. Come back one afternoon and just hang out with a book. But first things first. Head for the onsite ski rental shop, gear up and go see why Breckenridge is the #1 visited ski resort in the U.S. Not surprisingly, even after a day conquering blues, blacks or back bowls, the kids’ll still be asking to stop at the outdoor (thankfully heated) pool and hot tubs. Join them and thaw out while thinking ahead to dinner. You’re just three blocks off lively Main Street, so that’s always an option. Or you can send the kids to the game room while you toss a salad, heat up some garlic bread and get the pasta started (pretending like it’s far more work than it actually is). While you’re game-planning the rest of your stay, leave an afternoon (or three) for The Spa at Breckenridge, and save a night or two for the inviting CU Lounge – its name inspired by the scientific abbreviation for copper, discovered in local mines back in the day. Tasteful, alpine-themed two- to four-bedroom villas are all individually furnished and spacious enough to keep ski helmets, snow pants and base layers tucked away, out of main traffic areas. The views vary, from charming local community panoramas to partial or full mountain vistas. The living area is movie night ready, with gas fireplace, TV and DVD player. A unanimous movie vote is unlikely, so stick with a “majority rules” policy or plan a double-feature. The granite and stainless kitchen is gorgeous enough to inspire even non-cooks to give dinner a whirl. And if you’re on your game, and plan far enough ahead, the grocery shopping service will save you a few panicky, last-minute store runs (made even more panicky if a snow storm hits). Best known for its groomed blues, Breckenridge also has a T-bar up to the massive bowls and open terrain south of Peak 9 and 10. Neighboring Keystone is worth a visit too. It’s less crowded, and has the top-ranked A 51 terrain park. The super-adventuresome should head for the double black diamond Imperial Bowl topping out at almost 13,000 feet (flip your GoPro on to capture the incredible views). Swing by the concierge desk for insider tips on the best happy hours and après ski scenes, plus ski/snowboard valet, rental delivery and tuning. Downtown Breck is easily walkable, or you can hop the courtesy shuttle to catch live music, or check out the boutiques and breweries. 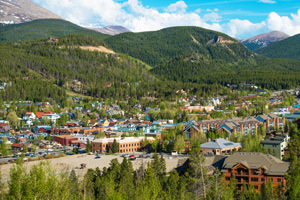 The festival-filled summer scene is equally spectacular, and outdoor activities abound, from fly fishing to rafting and rock-climbing, or golfing at the nearby Keystone Ranch or Breckenridge Golf Club. - Front desk is open 7:00 AM-11:00 PM daily during off-season. Guests that are planning to arrive after hours can pick up keys from a lock-box located outside the front desk office. For more details please contact the property using information on the booking confirmation. - Minimum Spring Break check-in age is 25 years old.